Preheat skillet over medium heat. Generously butter one side of a slice of bread. Place bread butter-side-down onto skillet bottom and add 1 slice of cheese. Butter a second slice of bread on one side and place butter-side-up on top of sandwich. 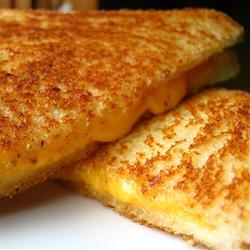 Grill until lightly browned and flip over; continue grilling until cheese is melted. Repeat with remaining 2 slices of bread, butter and slice of cheese.